The main goal of this initiative is to invite you to acquire global competency by learning languages and experiencing cultural diversity. Through this site, you can explore the many opportunities at Northwestern and beyond to enhance your global skills and succeed in our interconnected world. 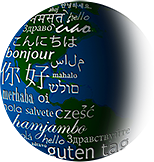 Find out how multilingualism benefits not only your career but your brain as well, and see how fellow Northwestern students have used their language skills to expand their worlds. Join us for fun and stimulating events and activities throughout the academic year 2012-2013. For more information, visit our Join Events page or our Planit Purple page.